Since Jamesford was founded in 1996, we’ve successfully completed numerous projects in different industry segments. Re-organising the sales and marketing around the key customer groups, linking operational support to customer lifetime worth and facilitating improvement change agenda for this national insurance company increased customer satisfaction & delivered savings of 25%. Our client is a market leader in the UK life & pensions industry. They operate one of the largest pension funds in the UK and sell their products via various channels to market – namely IFA’s, tied agents (Banks and BS) and JV’s. The business is profitable with an enviable track record and strong branding. However, impending government legislation (Sandler) would mean that the costs of sales and marketing and overheads, previously handled as sales commissions, would be made explicit to would be product purchasers’. Customers would be able to evaluate the product in terms of how much was spent on commissions and how much was being invested in the pension or life product. The industry leaders, quite rightly believed this would lead to increased competition and a squeeze on costs. The client asked us to look at the sales and marketing division to see how they could improve their effectiveness and reduce the costs of doing business. NB. 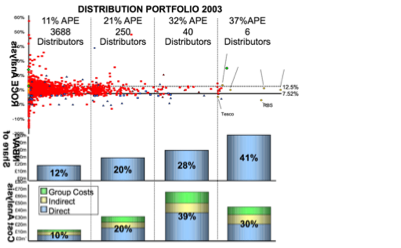 In segment 1 (large Banks and BS) 6 distributors accounted for 37% of ROCE (return on capital employed) and required 30% of distribution costs. Whereas in segment 2 (smaller Banks and BS) 40 distributors accounted for 32% of ROCE and required 39% of distribution costs. The challenge was to balance the business support in relation to the value created. Our recommendation was to re-organise the Sales & Marketing services, support and structure in proportion to the value derived from each customer group (the existing processes and structure bore little relation to customer value, but rather to historical precendent). Design a supporting structure for the operational processes. Specify the capability needs for each team. Manage the recruitment of managers and staff into the newly designed teams. Organised the marketing department to serve four customer groups. Linking service levels to customer lifetime worth. Result: savings headcount 35% and overheads 25%. The client is a major Life Insurance Company in the UK. They provide pensions, protection and investment products. Distribution is primarily through intermediaries (IFA’s, Tied agents and JV’s) with a small direct sales force. As a result of which the client commissioned a leading Strategy Consultancy to review their business model and make recommendations on how they should compete in the future. The report focused on the need to reduce the cost of distribution and made a number of proposals as to how the Sales and Marketing department could reduce these costs. The client wished to implement these proposals themselves but early on in the process decided they needed some independent help. The client asked us to help them manage the implementation of the proposals and deliver the savings. Programme management and facilitation with the key stakeholders. Our client is an autonomous engineering support division for an International oil company. 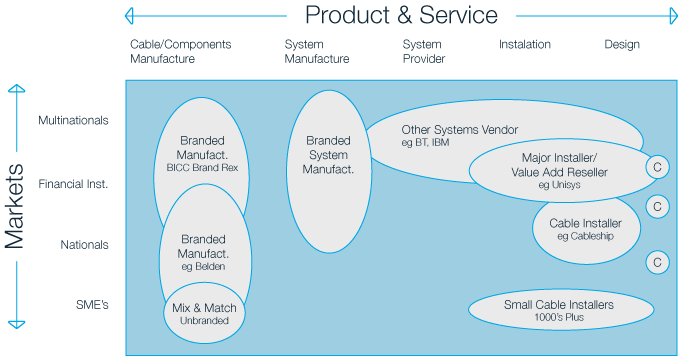 The business supplies engineering support in the shape of strategy, design and project management to the parent (85% of T/O) and third party companies (15% of T/O). Competitive bidding had been introduced for intra-group works in order to ensure an efficient internal corporate market. Unfortunately, the engineering business had started to loose out to third party bidders for corporate work. This was becoming an increasing trend and the management was concerned that their business may disappear unless something was done. The client asked us to review their business processes to see why they were loosing out on their bids. We conducted an in depth business review including competitor review, customer survey, operational process review, executive and staff structured interviews. And a change programme was developed and implemented to deliver the above. 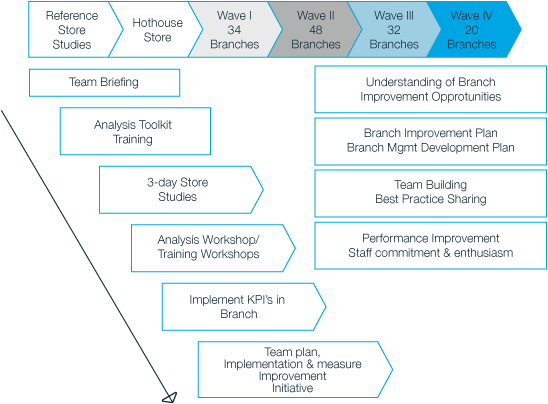 Aligning the mission, vision, values, operational processes, structure and culture around the customer, facilitated a step change in performance for this not for profit national membership organization. Our client is a National professional membership organisation. Their services cover training, professional qualifications, industry insights, advice and a national voice for the industry. Headquarters are in the South East, with active regional councils for a membership of 13,000. The organisation represents a relatively new profession, with a market potential of over 120,000 and opportunities to extend overseas. Like all new emerging organisations they faced issues around direction and purpose. The old guard preferred the low risk and profitable trade union style and the youngish turks wanted to pursue a complete professionalisation of their industry to achieve a chartered membership status. These divisions of belief/focus between the active regional base, the members council, the company board and its employees were creating a dysfunctional organisation. From the results we developed a straw model Mission/Vision/Values statement and work-shopped this with members of the membership council, board and staff. Having agreed the focus, values and objectives for the organisation we went onto develop the strategy, operational improvements, supporting structure and management process changes. Once again these were work-shopped to ensure acceptance and buy in. The result was a 92% acceptance of the newly developed focus and strategy from the various stakeholder groups (when we put it to the vote). Simplifying the core business support processes, eliminating the non-value add activities, re-organising around the internal customer support processes and facilitating the changes for this national Life Office delivered savings of 28%. Our client is a medium sized player in the Financial Services Industry. Their operations cover the provision of Investment, Protection and Pension products. Distribution is conducted primarily through a company employed sales team located throughout the UK and segmented into several customer-facing channels, with a growing contribution from the direct marketing operation. The business is in the midst of major change. The new watchwords are profit, cost control and value-add. The client was concerned that the overheads were too high (when compared to the competition) and would limit their ability to compete. The client asked us to review the cost base and recommend improvements. The key project activities consisted of an analysis & design, recommendations and implementation. Services which had previously been outsourced which no longer provided good value for money should be insourced and downsized. Insource Team. This team looked at the current activities and service levels from the outsourcer. Eliminated non value-add activities Mapped the remaining operational processes. Re-designed the process. Profiled the requisite skills. Planned the insourcing of delivery and transference to an existing team. Outsource Team. This team looked at the current activities and service levels. Eliminated non value-add activities. Mapped the remaining processes and improved same. Prepared a business case and ITT detailing the services to be outsourced. Prepared an implementation plan. Process & re-Organisation Team. The team reviewed the current activities and service levels. Mapped the key processes. Costed the processes. Re-designed the processes, eliminating those which overlapped or where non value-add activities. Profiled the requisite skill sets to perform the processes. Re-designed the departmental teams around the processes based on like skills. Prepared an implementation plan. Re-defined the business proposition, streamlined the operations, implemented new systems and introduced enhanced management reporting processes for this national Energy company. Result, now trading profitably with a number of new lines of business. Our client is a national energy company. They supply gas and electricity to commercial and consumer markets. They benefit from a strong well known brand and large customer base but had failed to really capture the inherent value of the business and its position in the marketplace. The client asked us to help them with the customer focus and culture change aspects of the strategic renewal and PWC handled the operations and IT issues. We conducted a review including competitor review, customer survey, executive and staff structured interviews. Customer focus – how to ensure we add value to everything we do on the customer journey? 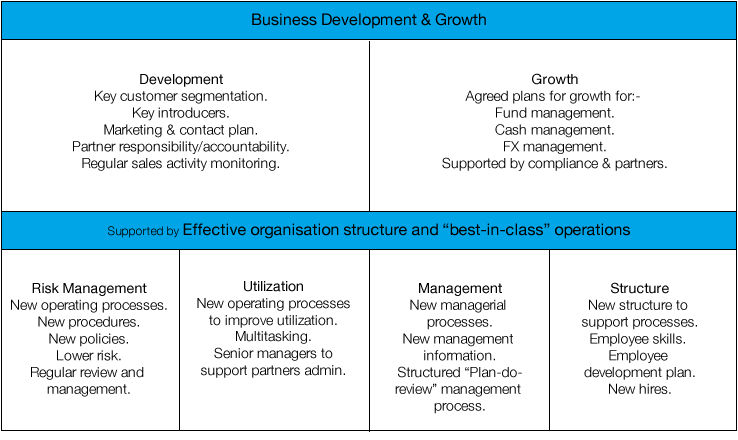 Structure – how to organise ourselves to support the business focus and our customers? Culture – how to eliminate blame, breakdown the structural barriers and create an empowered/mentored workforce? Re-focusing this division to focus on key customer requirements, streamlining the operational process to add value and re-organising the staff. Our client is a support division for a nuclear energy company. The business supplies a range of support activities to the parent and other members of the group. The group had recently introduced competitive bidding for support activities which could be supplied from third party providers. Unfortunately, the support business had started to loose out to third party bidders for corporate work. This was becoming an increasing trend and the management was concerned that their business may disappear unless something was done. The client asked us to review their business to see why they were loosing work to outside providers. We conducted an in depth business review including internal customer survey, operational process review, executive and staff structured interviews. Customer focus – how to serve the customer better? Operational effectiveness/efficiency – how to do more with less? Structure/Culture – how to organise around the customer and create a customer culture? Focused the business on key customer segments, trialled new look/feel retail concept plus product plus service approach in six leading branches, rolled out the concept nationwide in this national Shoe chain. Result, 15% uplift in sales and profits. Our client is a market leader in the UK retailing industry. In the past 8 years, the increase in competitors and change in production and manufacturing (from local to overseas), had resulted in a decline of market share. Internally, organisational growth had produced a large, hierarchical structure with little cross-fascia communication, minimal use of economies of scale for central functions or negotiation, poor customer focus and disjointed buying, merchandising and supplier processes. The client felt action was needed to revitalise the dominance of existing fascias in the market, provide clarity of product and ensure it continued to return high profits to the owner – a major retail holding corporation in the UK, while developing new concepts. Develop a team approach throughout the fascia, increasing levels of functional co-operation and trust to solve problems and achieve higher performance. Create a sustainable customer focused business with a drive for continuous development and improvement. Make major improvements to customer and store profiling, range focus, product scheduling and supplier management. Results of the change programme are summarised below, with first full-year benefits attributed to be between £8 – £15m profit. Facilitating the change from a culture based on product push towards one based on customer pull. Result: 15% increase in customer satisfaction. Our client is a market leader in the UK retailing industry. In the past 8 years, the increase in competitors and change in production and manufacturing, had resulted in a decline of market share. Internally, organisational growth had produced a large, hierarchical structure with little cross-fascia communication and poor customer focus. The client felt they had lost sight of the customer. They had evolved into a product push business when what was needed was a customer pull culture. If they could get closer to their customer, they could improve their competitive capability. The fascia lacked focus. Some 50% of footfall was undertaken by people who used to shop here but couldn’t find anything suitable. Conversion was only 7%. 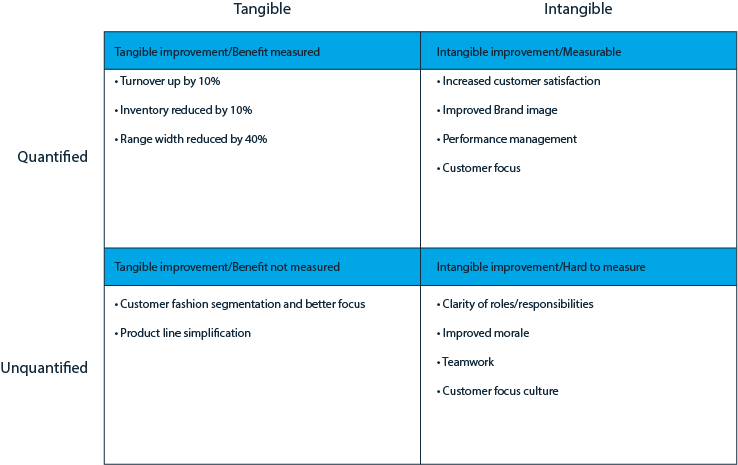 Management and the key teams, namely merchandising and retail, engaged in internal competitive behavior often at the expense of the customer and overall business. 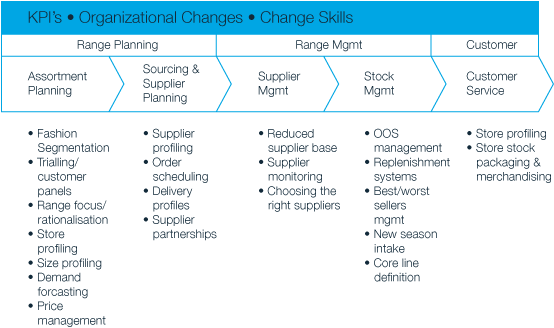 Operations – supply chain/customer journey. With a brief to develop a seamless journey between customer demand and product supply. Organisation – structure, management and culture. With a brief to look at how the organisation structure, management processes and culture would support the customer pull concept and create a truly customer centric business. The change teams presented their findings to the board and the executive and helped in implementing the resultant change agenda. The methodological approach was subsequently rolled out to the other fascia’s. Developing a customer first strategy for this national membership organisation. Our client is a National professional body. Their services cover training, professional qualifications, insights, advice and a national voice for their members. They are one of three professional bodies which are of similar size, ranking and provide very similar services, in what might be considered a crowded marketplace. Competition between the three bodies had to a large degree been based on market perception of the respective professional qualification and the success of their members. However, the search for competitive advantage was ever present and the client was keen to ensure they could maintain an edge on the others. The client asked us to help them to develop their own version of a customer centric strategy and implementation plan. We conducted a series of interviews with the various stakeholder groups. From the results we developed a straw model customer centric strategy and a gap analysis of where the client was currently operating. The final step was to develop a change programme for the executive to follow. The result was a client owned customer centric strategy and implementation plan. The story continues as the client continues on the journey. Re-designing the customer management process to add value for this national Telecoms company. Result, increased customer satisfaction. Designing the customer journey to maximize value creation, organizing the supporting business activities around the customer and facilitating the improvement agenda for this national cinema chain delivered a 40% improvement in customer satisfaction and 22% hike in profits. Our client is a market leader in the UK leisure and entertainment industry. They have 80 entertainment sites and 5,000 people. The business is profitable with a customer base of some 13 million and sells more tickets per year than the closest competitors. Their strategy has been one of cost leadership in a very competitive marketplace. However, despite their obvious popularity only 3 out of 10 customers were aware of their brand. Their nearest competitors on the other hand enjoyed customer unprompted awareness scores, respectively of 7 out of 10 and 8 out of 10. As a consequence their competitors were able to charge higher prices and achieved higher margins. The client was well aware of the issues and was in the process of developing a number of strategic initiatives to improve their competitive capability, ranging from new IT systems, e-commerce & e-marketing to new formats & enhanced technology at sites. They recognized that they needed a coherent customer strategy to make sense of these initiatives and that they required some external assistance to make sure it all fitted together and could be delivered. The client asked us to review their strategy, proposed initiatives and their ability to manage a change programme encompassing many project areas. We produced a programme plan encapsulating their initiatives into a single theme, namely to put the customer first. The touchstone for each initiative was “Does it add value to the customer offering and to the bottom line?” The strategic premise underpinning the approach was that the business should move away from a cost leadership model to a differentiated service offering. If customers experienced better service (13m customers passed their doors every year) and a better overall experience they would remember the brand and recommend it to their friends. Brand awareness would improve and the business would be able to compete on service rather than price. The client asked us to help them implement the programme plan – which we called the Customer First Programme. Staff research – to understand current values/behaviors and how these would need to change to meet customer needs. 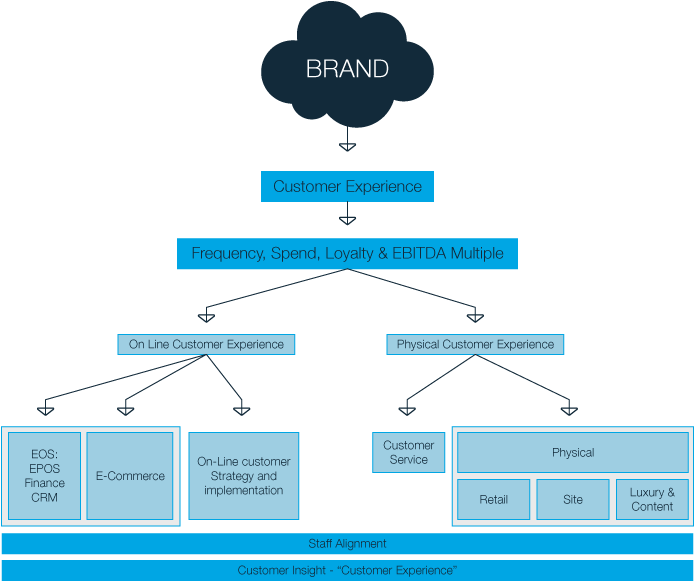 E-commerce/e-marketing strategy, planning and project managing the implementation – the e-commerce platform required re-development to enable the capture of customer data for targeted marketing. The e-marketing strategy required delineation to target market to 4 customer groups. Branding – the brand strategy and positioning needed development and alignment with the business objectives. Entertainment site design – although this had evolved in a somewhat erratic fashion, the time was apposite to clearly define the physical site of the future, incorporating all the ideas and needs of customers. Identity and Communications – the brand identity required clear articulation to match the brand positioning. This then required communication to staff and customers. Staff alignment/engagement – the above represented a significant change in direction for the business and the staff were the ones who would bring it about. Customer strategy team – facilitation of the senior multi-disciplinary team to develop the customer strategy, plans and communications. Staff alignment/engagement team – facilitation of the multidisciplinary team to determine how the business would need to change and how to implement. Customer service team – facilitation of the multidisciplinary team to determine the desired customer service offering and how to implement. The programme has been a great success. The foundations of change have been firmly embedded in the business and the change agenda continues. The organisational values are now regarded as a key component/enabler in the delivery of the brand promise. Customers have been placed at the forefront of the strategic intent and operational delivery. Utilising the power of internal change teams to develop the customer facing cultural attributes and the associated cultural change agenda. Blame was banished and the new bywords were empowerment and mentoring. Our client is a market leader in their service-based industry, with 80 physical sites and 5,000 people employed. The business is profitable, with a customer base of 13 million and three principle competitors. Their strategy had been to offer their customers best value for money in a very competitive marketplace and to focus on operational excellence. Whilst this formula had driven success for several years, it was becoming increasingly apparent that the future required a different approach. The client asked us to help them change their customer experience and re-focus their culture on the creation of an excellent customer experience. The analysis phase looked at the competition, customer requirements, current service proposition and organisational culture. The key findings were that customers felt processed, the service interaction lacked any personal engagement and as a consequence only three out of ten customers remembered the brand. Interestingly, staff felt constrained and wanted to improve the customer experience/service. The primary cultural barriers were around blame, an emphasis on control and a reward/recognition system focused on operational efficiency. Customer strategy team – facilitation of the senior team to develop the customer strategy, plans and communications. Employee brand/culture team – facilitation of the multidisciplinary team to determine how the business would need to change and how to implement. The executive team has a clear understanding of the customer strategy, the operational processes and cultural norms, which enable delivery. Management regularly review progress of the changes. The new metrics focus on the Net Promoter Score (NPS) and the Employee Promoter Score (EPS). Operations. 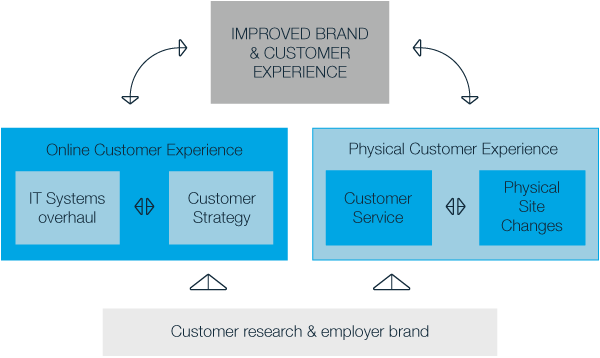 The focus has moved from operational efficiency to an effective customer experience. Process, customer interaction and cultural norms are continually measured and managed. Great customer service stories are celebrated. Employee brand. The employee brand and distinctive competencies of the business are incorporated into the recruitment, training, learning, reward and recognition processes across the group. Cultural reinforcement is around banishing blame, supporting coaching and promoting empowerment. Re-organising the HR function around the internal customer requirements. Eliminating non value-add activities and creating service level agreements. The Head Office Personnel function, with its historical focus on pay and benefits, was finding it difficult to keep pace with the culture change requirements. As a result the Young Turks in management were developing their own human resource activities. The field Sales Recruitment and Training function was proving to be a drain on resources and wasn’t delivering a sufficient number of trained financial advisers to keep pace with the Sales team turnover. The project consisted of an HR Audit to surface the issues and the internal customer requirements. 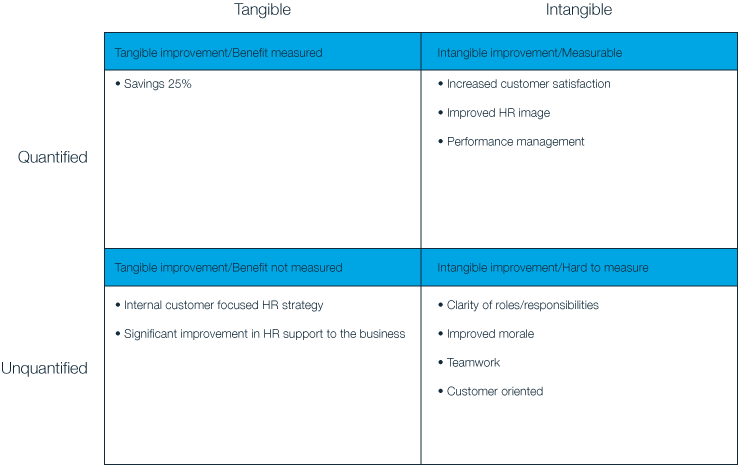 Comparison of the existing HR programmes and practices with best practice models. The joint design of HR strategies structure and processes. Followed by the implementation of the proposals utilising client change teams. Having established the core Business Drivers, HR strategies were developed to support key business objectives and integrate existing initiatives. Introduction of performance management principles. Creation of a balanced set of measures based on the key business drivers to create goal congruency. Operationalisation of the measures in a systematic plan-do-review process. HR processes were designed by the change teams to deliver the strategy. The result was the elimination of duplicated activities and functional silos. The new structure and job responsibilities represented a dramatic change from the past. We therefore developed new job descriptions and conducted a series of competency based interviews to select the most appropriate people for the new roles. Personal development plans were introduced to support this activity. Designing the merged operations of two regional telecomm companies around the customer, ensuring the potential synergies were realised and facilitating the changes enabled the newly established national company to significantly grow. Our client is a major operator in the Cable TV/Telephony Industry. Their operations include the design and construction of the network, the operation of Cable TV/Telephony services and the recent development of a programming capability. They provide a full range of telephony services to commercial subscribers and cable tv/telephony services to residential customers. The business has recently been created from the merger of several regional players into a national organisation with a significant network which is strategically placed to provide alternative routes for UK traffic. The client was concerned that having reorganised the business and embarked upon the introduction of a new customer management system – including the re-engineering of customer facing processes – customer service was still perceived to be poor. Moreover they realised that the delivery of excellent customer service can be a major differentiator in terms of competitive capability, which would allow them to add value to the core product offering and effectively compete with BT and BSkyB. The client asked us to ask their customers what they thought about the current levels of service, to assess the organisational attitude to the delivery of customer service and to help them improve. A consumer survey was undertaken to determine the relative importance of the various elements of the product/service mix and the consumers’ views of existing service levels. Integrating the survey results into a programme of improvement ensured that the project was seen as part of the day to day management of the company, whilst providing tangible, measurable and focused results. Facilitating the top team in the delineation of the customer strategy. Developing the change agenda and helping the client deliver. Our client is a major service provider. Their operations include network construction, and the provision of entertainment and communication services to both commercial and residential consumers. Distribution is primarily conducted through direct and telephone sales channels. The strategy for growth was fragmented and unsupported by business plans. The senior and middle management team neither believed in the strategy nor identified ways in which it could be implemented. The current structure was impeding growth. The client asked us to integrate the business objectives into a coherent strategy for growth which was supported by workable business plans, to gain senior management buy in and design an organisation structure which would enable implementation of the business objectives. Working with the top team in a series of one to one and group workshop sessions we integrated the business objectives into a cohesive strategy, combining the requirements to provide a segmented approach to the market and differentiate the product offering through customer service with the need to introduce an effective and responsive strategic management process. Having developed the Corporate Strategy we set about explaining it to the business by forming six multi-disciplinary strategy implementation groups. Each group, comprised of senior managers, were given the task of formulating detailed operational plans to deliver specific aspects of the strategy. They worked together in facilitated workshops over a period of three months and produced detailed plans for implementation. The process of operationalising the strategy highlighted the key business processes which would deliver success. We then set about designing a structure which would support the business processes and reflect value add in the chain of service delivery. Our client – a National College – was established in 2001 to improve leadership in schools. The college was staffed by 330 employees – mainly ex head teachers and training professionals – and employed numerous external training individuals/agencies. The campus activities extended over three sites with a budget of £120m. Our client was concerned that the organisation had grown in size and remit beyond its original intent. Our client asked us to make the organisation more efficient and to reduce costs. Re-Organisation Team. The team reviewed the current activities and service levels. Mapped the key hi-level processes. Costed the processes. Re-designed the processes, eliminating those which overlapped or where non value-add activities. Profiled the requisite skill sets to perform the processes. Re-designed the departmental teams around the processes based on like skills. Prepared an implementation plan. Focus the business on the key customer groups, re-design the customer journey around the customer, streamlining operations, reorganization to add value to the customer proposition and facilitating the changes for this regional Telecomms company. Result, profitable growth. Our client is a medium sized operator in the Cable TV/Telephony Industry. Their operations are vertically integrated including the bidding for green field franchises, design and construction of the network and operation of Cable TV/Telephony services. They provide a full range of telephony services to commercial subscribers and cable tv/telephony services to residential customers. Recently they have experimented with programming and the provision of consultancy services to European markets which are in the process of de-regulation. The business has grown rapidly from a single site to multi-site operation with incumbent issues around management control. The client was concerned that the business was significantly behind expected performance levels. Penetration levels were low, customer complaints high, expenses were significantly above budget and cash flow was significantly adrift from that forecast. Segmenting the customer base, re-designing the service offering to cater for the specific needs of the different customer groups. Re-designing the organisational structure to support the customer facing strategy. Creation of work teams focused on the different customer segments. Clarity of roles, responsibilities and expectations. Introduction of performance management principles utilising the Balanced Scorecard methodology. Creation of a balanced set of measures based on the key business drivers to create goal congruency between Engineering, Marketing, Customer Services and Finance. Operationalisation of the measures in a systematic plan-do-review process. Co-ordinating the build activities with the marketing activities to reduce negative cash flow. Introduction of personal development plans. Team based training on Customer First, Team Roles and Performance Management principles. Focusing the business on the key drivers and organisational blockages to benefiting from a bancassurance strategy for this national bank resulted in an uplift of sales to traditional bank clients of 21%. Our client is a major Financial Services organisation. Their UK operations include all aspects of Personal and Corporate Banking as well as the provision of general lines of Insurance and Life Assurance. Distribution is via an extensive retail branch network and an established direct channel of branded services. The Life business was established in the late 80’s with a view to pursuing a Bancassurance strategy, whereby non-banking financial service products including Mortgage, Life Protection and Pension products are sold to the warm and extensive client base. However, penetration levels have remained low despite the adoption of various business models over the years. Our client asked us to look at the business and help them with their objective of equipping career bankers with the ability to sell a full range of financial service products. We conducted a detailed analysis of the Banking and Life businesses including a review of strategic aims, structures, cultures, managerial processes, sales and marketing processes and staff competencies. Our recommendations included a series of detailed operational improvement strategies to address these opportunities. Development of a model of how the Bancassurance business process actually operated, utilising the “I-Think” business modelling software package. The model was designed to reflect the cause and effect relationships between the business variables, namely Strategy/Structure/Culture/Process/People, in a Sales Funnel environment. This Bancassurance model is interactive, participants can evaluate “What If” scenarios by varying the business mix and thereby formulate their plans for improvement. Both of the above were used initially by the business management team at their offsite sessions on strategy formulation and then more extensively in the business as part of an integrated organisational learning approach. Developing a strategy for launching/penetrating the office fit out market for a national Building company. Result, the new business is growing and profitable. Our client is a major construction company. They build homes and offices across the UK and enjoy an enviable reputation for quality and timely project completion within budget. In the search for adjacent profitable markets, they decided to enter into the lucrative office fit out market in London. The CEO of the newly formed office fit out division asked us to prepare a market entry/penetration strategy and plan. We prepared an analysis of the office fit out industry including, size, profitability, influences, segmentation analysis, trends and broad company profiles of the existing players allowing us to identify a potential gap in the market. We went onto develop a marketing strategy and plan to exploit the opportunity utilizing the parents brand and existing market contacts. Our client commended our report as very useful and is now actively delivering lucrative projects in the office fit-out market. Developed market growth strategy, streamlined the operations to focus on profitable lines of furniture for best performing market segments, streamlined supply chain, eliminated non performing products/segments/services, implemented new systems and management processes for this national Furniture chain. Result, business turned round and trading profitably. The business is overtrading with insufficient capital. The directors have been highly successful in growing the business, but lack the experience and knowledge to implement good management practices which would give stakeholders and potential investors the confidence to grow the business further. The bank has expressed a lack of confidence in the management team and requires significant personal guarantees from the directors in order to continue with the current banking arrangements. Reviewed the financial statements and established that the accounts had been significantly miss-stated for the last five years, resulting in a misconception over profitability. These were then re-stated. Prepared a detailed profit forecast for the next two years and established the viability of the business. Implemented strict cash management procedures as the business was cash constrained. Use of loss leader products during the four key sale periods throughout the year. Use of overlapping media advertising. Developed management reporting processes and established a robust Board review of progress. Prepaired a business plan encapsulating the proposed benefits. Introduced and embedded best practice business governance practices to a mid sized national retailer prior to re-financing the business. Our client is a leading and very successful UK retailer. Operations include a retail network throughout the UK supported by regional distribution centers and a head office in the south east. The business has grown organically from a startup position to market leader in its sector. The rapid expansion has created pressure on management’s time and the business finances. The company’s Bankers felt exposed and consequently imposed a dramatic reduction in the financing facilities. We were asked to review and improve the business and financial governance procedures with a view to securing improved banking terms. Defined the business strategy, business plan and budgets for the board and senior managers review. Delineated the organisation structure and created clear roles/responsibilities for the board down to the middle managers. b) capitalisation policy, c) product costing and, d) stock management. Recruited a new FD and key finance people. Implemented a new accounting system. Implemented a new financial reporting & review process. Implemented supply chain system and associated reporting. Our client is a medium sized player in the Financial Services Industry. Their operations cover the provision of Investment, Protection and Pension products. Distribution is conducted primarily through two Company employed sales teams located throughout the UK and segmented into several customer-facing channels, with a growing contribution from the direct marketing operation. The company was facing increased competition and the newly appointed CEO wondered what made them different from the opposition. The CEO asked us to help them become more customer focused. He felt that this was a potential source of competitive advantage. We undertook a business analysis, reviewing the industry, competitors, segmenting the players and their customer base. A clear opportunity existed for this company to excel in customer centricity. They had a sizable customer base, which they had failed to properly explore in terms of how to create added value. We discussed the opportunities with the executive team. Conducted several workshops on customer focus and the changes required. The CEO decided he would like to share the findings with the business and set the operational management the task of developing the future for the business. Investment – how can we establish a track record in first quartile investment results? Sales/Marketing – how can we service our existing customers better? 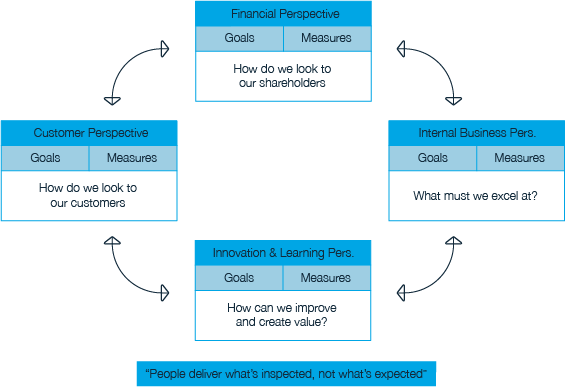 Operations – how can we leverage our operations to create better value for our customers? Culture/Structure – how can we become customer centric in everything we do? 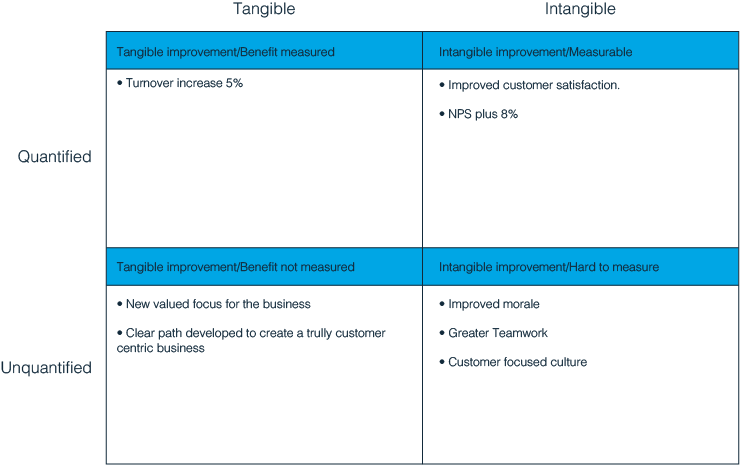 Using the balanced scorecard as a catalyst for driving and communicating the change agenda. The numerous organisational strategic objectives lacked an integrative framework. Managers, Business Units and Projects competed for directors time and business resource without a clear mechanism for prioritisation. Departmental Initiatives designed to deliver departmental objectives often conflicted across the business. Measuring progress against plan was achieved via a mix of financial and operational performance indicators which often gave conflicting messages and didn’t give the full story. Employee performance and subsequent development, although based on organisational competencies, failed to link individual accomplishment to business success. The client asked us to review the business control processes and help them to produce an integrative system utilising the principles of the Balanced Scorecard methodology. Working with managers throughout the organisation we reviewed the existing business strategy setting, operational planning and performance measurement systems. These were critiqued against the Balanced Scorecard (BSC) concepts and the gaps were identified. Working with the top team in a series of one to one and group workshop sessions we prioritised and integrated the organisational objectives around the BSC framework of Customer, Operational, People and Financial goals. We then developed a corporate scorecard for the top team. Working with the senior and middle management groups we designed the operational scorecards across the business linking corporate objectives to the grass root drivers of performance. Working at various levels within the organisation we designed individual scorecards linking personal performance and development to the business objectives. Working with the management group we designed and captured the BSC information. Working with the whole business we implemented the BSC management process. Business evaluation of a Greek downstream marketing/distribution petroleum company. Our client is a Russian Oil company with interests abroad. Their operations cover upstream exploration and downstream refining, marketing and retailing. They were interested in expanding their downstream operations into Greece. A potential acquisition in the form of an independent Oil Company with a retail network, supported by storage depots and head office. Our client asked us to value the business for them. Asset valuation. We appointed a local asset valuer in Greece to undertake an independent valuation of the land and buildings on an “in use” and “alternate use” basis. Market valuation. We looked at similar listed Oil/Gas companies in Greece and developed a valuation range based on similar business characteristics. Free cash flow valuation. We took the free cash flow analysis provided by the target companies advisers and critiqued the methodological approach. The key areas for critique were the discount factor used and the assumptions employed. The above analysis provided a valuation range. We went onto augment this with an industry analysis and market fit for their business. Re-focus the organisation on its core mission, streamline the operational processes, outsource non-core activities, reorganisation, change of restrictive HRM processes/policies and implementation of enhanced management processes for this Non Departmental Public Body. Result, costs reduced by 25%. Five internal change teams developed the customer strategy, the marketing support, regional footprint and organisational structure. Our client is a National Life & Pensions company. They operate one of the largest pension funds in the UK and sell their products via various channels to market – namely IFA’s, tied agents (Banks and BS) and JV’s. The business is profitable with an enviable track record and strong branding. However, increased competition and a squeeze on costs meant the business had to do more with less. The CEO decided the Sales/Marketing division needed to save 25% on costs and asked us to help them deliver the savings via their own change programme. Customer segmentation – how should we segment the customer base? Customer service – what level of service should be delivered to each segment? Operational effectiveness – how can we improve operational effectiveness? Regional footprint (and homeworking) – how can we reduce the regional footprint? Structure – what structure and skills would support the new sales/marketing division? The business strategy and plan had been prepared by this leading Private Equity investor – a robust and challenging agenda. Our role was to help the management of this ATM provider to deliver the savings. Result EBITDA increased from 7% to 18%. The client is a medium sized Venture Capitalist with a diverse portfolio of investments. They purchased two specialist financial service companies with the intention of merging same and delivering the synergistic benefits. However, initial efforts to merge the companies and deliver on the business plan had highlighted weaknesses in the management team. The client felt that an external resource with strong change management and financial expertise would help shape the new business while they considered changes to the top team. The client asked us to assist the directors in merging the two companies and to focus on the delivery of the originally budget financial benefits. Design and delivery of a management reporting process to highlight performance gaps. Participation in the monthly board meeting to drive the change agenda. Facilitating the top team development of the customer strategy and design of the change programme. Followed by periodic help with implementation. Our client is a major service provider. Their operations cover the provision of a diversified range of products directly to consumers. The Business has recently been created from the merger of several smaller players, which has precipitated a complete organisational restructuring, the appointment of a new Top Team and the refocusing of the strategy. The client was concerned that, despite the time and energy which had been devoted to the re-organisation and re-alignment of objectives, the business was failing to meet targets, customer complaints were increasing and morale was low. One to one interviews were conducted with the top team and senior management group in order to uncover the organisational issues. Focus group sessions were conducted with a stratified sample of middle managers and junior employees in order to gain a working knowledge of how the organisational issues were affecting the day-to-day operations. A series of workshops were conducted with the Top Team and Senior Management group, whereby we jointly reviewed the organisational blockages, considered alternative solutions and designed an improvement programme. We jointly designed a communication programme to explain the new organisational structure, business processes and objectives. We set up five improvement teams, each with a main board Director and cross functional membership, with the brief to deliver a specific objective and break down the organisational departmental barriers. Aiding the CEO in the establishment of the NDPB on best practise commercial lines. Our client was concerned that previous efforts to establish NDPB’s along commercial lines had resulted in lengthy delays and inertia. Operating plan. We went onto develop a detailed operating plan for the next three years. Structural plan. Developed the organisational plan and resource requirements. Management and governance. Developed appropriate best in class business management and governance practices. The NDPB was declared ready for business by the audit commission and an enactment of parliament enabled the commencement of trading all within six months (the previous NDPB had taken 20 months). Developed an audit model to ensure value for money from the water companies. Our client operates in the Office Refit/Refurbishment Industry. Their operations cover the specification and project management of large office refurbishment’s. They enjoy an enviable reputation for quality, effective management and timely project completion within budget. All of which has facilitated consistency of returns and a share of this competitive UK market of some 10% plus. However, like all customer focused businesses they continually explore ways in which they can add value to their service offering and get closer to their customers. They were considering broadening their service offering to include the design and build of the IT Cabling Systems which facilitate Voice, Data and Video communications in buildings, since these systems are usually replaced during refurbishment. Hence, they asked us to conduct a market survey of the IT Infrastructure Industry in order to assess the attractiveness of entering this industry and to survey their existing customers to see if they would buy the new service. We prepared an analysis of the industry including, size, profitability, influences, segmentation analysis, trends and broad company profiles. Having selected a shortlist of companies we then conducted exploratory interviews at director level with these organisations, which enabled us to prepare detailed company profiles including, market focus, strategy, profitability, growth and routes to market, including an evaluation with respect to business attractiveness, strategic fit and recommendations on type of alliance. Our researchers conducted a survey of the clients customers by segment and we analysed the results. The whole process was conducted in a 6 week time frame. Our client commended our report as invaluable in terms of facilitating the decision on entering the IT Infrastructure Industry and in terms of the recommended strategy for doing so. Our client is regional nuclear energy company. The business includes two reactor installations supported by a head office and staff of some 2,500. The new CEO was concerned that the electricity generating costs of the business were amongst the highest in the UK. This meant the company was at a disadvantage when supplying the grid and would also affect any future potential merger opportunities. The client asked us to see how to reduce the cost base and make them more efficient/effective. We conducted an in depth business review including industry benchmarking, expert interviews, top team appraisals, operational process review, staff survey and focus group workshops on the issues. Structure – how to organise for efficient/effective support to the business? Culture – how to create the winning team? The client felt action was needed to revitalise the dominance of existing fascias in the market, provide clarity of product and ensure it continued to return high profit to the owner – a major retail holding corporation in the UK, while developing new concepts. Developing a segmented approach to penetrating consumer markets. Our client is a major service provider. Their operations include network construction, and the provision of entertainment and communication services to both commercial and residential consumers. Distribution is primarily conducted through direct, retail and telephone sales channels. The client was concerned that sales growth was significantly behind budget, the marketing spend was not delivering the expected levels of penetration and as a consequence the planned network growth was in jeopardy. They realised that a segmented approach to understanding and fulfilling the diverse needs of the potential customer base was appropriate but felt that some help was needed. The client asked us to help them with their market analysis, marketing strategy and promotional plan. One to one interviews were conducted with senior Sales and Marketing managers to determine the efficacy of the existing marketing strategies. Desk research of consumer and marketing information was undertaken to provide hard data on current and potential customers. Reviewed customer needs and the existing value propositions. Segmented consumer markets, defined customer requirements and delineated the customer value proposition – which were then tested through a market research programme. Positioned the brand, the price, the promotion and channel for effectively taking the product to market. Designed test marketing and final marketing programmes. Designed marketing information feedback and review processes. Re-organising the back office, streamlining the operations, eliminating non value-add activities, outsourcing, insourcing and deploying a zero based budget approach to reduce costs. Impact: savings of 30%. Challenging legacy mindsets, focusing on the needs of the internal customer, employing the power of zero based budgeting, eliminating the non-value add activities, outsourcing non-core activities and in-sourcing core activities for enhanced control for this national insurance broker resulted in savings of 30%. Our client is an International Insurance broker. Insurance services cover a broad range of corporate assets, including buildings, airlines and shipping plus corporate liability for employees, products and customer services. The business is organised around service lines to its customers with core support activities being centralised in the UK. Our client was concerned with the size of the central support costs including IT, Admin and Finance. Our client asked us to help them to reduce the cost of the central support services by 25%. Re-Organisation Team. The team reviewed the current activities and service levels. Mapped the key processes. Costed the processes. Re-designed the processes, eliminating those which overlapped or where non value-add activities. Profiled the requisite skill sets to perform the processes. Re-designed the departmental teams around the processes based on like skills. Prepared an implementation plan. Our client is a market leader in their service-based industry, with 110 physical sites and 6,500 people employed. The business is profitable, with a customer base of 14 million and three principle competitors. The client was beginning to recognise that the experience they were giving their customers was not as good as that provided by some of their competitors and was not taking full advantage of the advances in technology that were transforming the customer experience in other markets. Their IT systems were not up to standard and they didn’t have the technology or skills required to communicate effectively with customers in an internet and mobile enabled world. Our initial brief from the client was to review their strategy and proposed initiatives and to develop and help them manage a change programme encompassing their various strategic initiatives. When we had conducted our initial review, it became apparent that a more fundamental change was required. It was clear that, in spite of their success to date, they had failed to focus on the customer and had a poor understanding of customer needs and attitudes. They had also placed little priority on the development of a strong brand, which meant that they were increasingly at a competitive disadvantage. One symptom of this was lower pricing and inferior margins. Another was unprompted brand awareness significantly lower than that of their competitors. We concluded that their strategic plans needed to be placed in the context of an overall change programme focused on the customer. We worked with them to produce a programme of work that would not only address their need for new technology, but would also begin to build a customer and brand focused culture throughout the organisation. This was the genesis of the “Customers-r-us” programme. Underpinning the programme was the strategic premise that they should move from competing purely on value and operational excellence to a proposition based on a better customer experience and a more desirable brand. The programme’s central goals were related to development of the brand and the customer experience. In addition to hard financial targets that would improve EBITDA multiple, the programme was designed to achieve improvements in customer frequency, spend and loyalty. The programme itself had a twin focus – the On-line and Physical customer experience – underpinned by engagement and alignment of staff and driven by customer insights. In recognition of the breadth of the changes required, we formed Change Teams for each component of the programme. These teams consisted of people at different levels of the business, jointly facilitated by Jamesford and client team leaders. This approach ensured that the client owned each aspect of the change, whilst allowing for Jamesford to introduce best practice and keep progress on track. The teams were integrated in a strategic oversight group and progress was regularly reported to the client Executive Team. Qualitative and quantitative research to ensure full understanding of customers’ current views and their desires for the future. Also the establishment of brand tracking benchmarks to enable measurement of brand strength over time. A comprehensive cultural survey to understand current values/behaviors and how these would need to change to meet customer needs. Development and embedding of future organizational values. Review and development of an effective brand proposition to compete effectively in the future and align with the business objectives. Planning and project managing the implementation – the e-commerce platform required re-development to enable the capture of customer data for targeted marketing. Development of an e-marketing strategy targeted at four key customer groups. Development, testing and piloting a new customer service proposition to meet emerging customer needs. Evolution of the brand identity and internal/external communications to deliver the new brand proposition. A programme of staff engagement to ensure understanding of the change and their individual roles in making it happen. The “Customer-r-us” programme represents only the beginning of a much longer journey for the business. Transforming the customer experience and building brand equity are not changes that happen overnight in any organisation. Nonetheless, there have already been significant benefits from the work to date. The foundations of change have been firmly embedded in the business. Customers and Brand have been placed at the forefront of the strategic intent and operational delivery. The organisational values are now regarded as a key component/enabler in the delivery of the brand promise. The new IT systems have been delivered to time and budget and are already producing the improvements promised. Performance improvements covering route to market, cycle compression, operational efficiency and management process. Impact: profits up 15%. Our client is one of the major Guernsey-based Wealth Management service providers. Their services cover Investment management, trust provision and currency management for private clients. The business enjoys long standing relationships with both clients and introducers. the funds administration market in Guernsey, in particular of expert funds, is expected to show strong growth. The forecasted change in business mix and the changes in the marketplace are an opportune time for a review of the business operations to ensure its effectively and efficiently managed. Our client asked us to undertake a business review to ensure the operations were effectively organized to meet the challenges ahead. 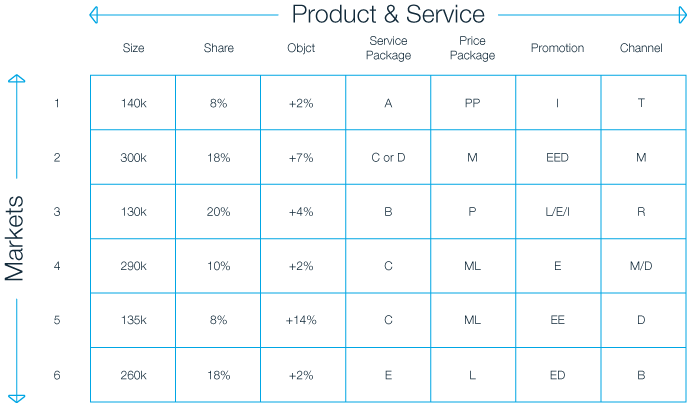 Cost to serve for the key product areas. Inadequately documented policies and procedures. Plus evidence of policies being circumvented. We then documented the key areas and nature of the changes required to address the above weaknesses. Reviewed existing key processes (Fund Management, FX Management) using process map techniques. Reviewed management data and developed enhanced management information system (short term:- use of existing data and spreadsheets; long term:- new time recording system). Prepared process maps for the key activities looking at efficiency and effectiveness aspects. Critiqued existing processes with stakeholders and developed more efficient processes eliminating poor utilisation of resources. Recruited several key managers to support partners.